On Saturday night, June 8, 1878, an Indianapolis & St. Louis Railroad train sat in the old Union Station in Terre Haute. The crew stepped out of the depot at 10th & Chestnut readied the train for another trip west. 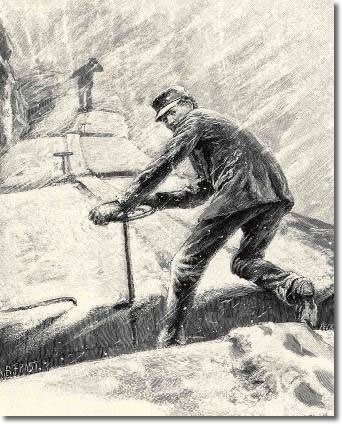 Climbing onto the caboose after checking the couplings on the cars was James Murray, the brakeman. His was one of the most dangerous jobs in railroading. Brakeman had to climb upon railroad cars to operate the brakes, even in the worst of weather. A slip or misstep could be fatal. But the weather appeared to pose no problems this June night. The way ahead seemed clear. They would cross the railway bridge across the Wabash River, turn northwesterly and head to the big city on the Mississippi. A little earlier that evening, less than three blocks away men gathered at Peter Staff’s Saloon at 9th & Wabash. Staff was from a family of saloonkeepers and an inveterate inventor with many patents to his credit. He ran a respectable saloon as Terre Haute saloons went. Two men sat near the bar leaning into their drink and plotting quietly, they thought. They crossed the railway trestle an hour or so before Murray and the train. After midnight figures lurked near the St. Mary’s depot as most of the village and the sisters and students at St. Mary of the Woods slept to await a Sunday morning. As the I & St.L steamed north of Macksville to St. Marys, darkened figures scuttled across the tracks.to change the switch and move the fasteners. Murray and the train did not have a chance. The engine jumped the track, taking with it its load. James Murray was thrown from the caboose. He was crushed by the wreckage. Awakening came early for St. Marys that morning as the terrible sounds of the derailing pieced the calm night. As they scurried to their doors and windows James Murray lay dead along the tracks. The railroad company was incensed. They saw this incident as yet another of the “villainous attempts to destroy human life [and the railroad] by its enemies.” Not having great faith in local authorities, perhaps, the management of the I & St. L looked to hire “Agents, Attorneys & Detectives” to investigate the case. Two of the “detectives” they engaged were denizens of Staff’s saloon. George Jackman and James Knight, many who knew them might have said, were two men more likely to be investigated by detectives than assume those roles themselves. But the railroad seemingly knew what they were doing and set the two often-sotted bloodhounds on the trail of the killers of James Murray. By Fall, Jackman and Knight reported their “findings” to the railroad. Interestingly, they averred, they had been witnesses to a string of events that culminated in them witnessing the train’s derailment. They spotted a man named Oliver Wilson in Terre Haute that night. For reasons they never adequately explained, Jackman and Knight then decided to walk across the Wabash trestle. Just enjoying the fime night for a walk, one assumes. While on their sojourn, the pseudo-detectives say they came upon Oliver Wilson and his companion William Kahoe, in excited conversation. Jackman said he clearly heard Wilson say “I’ll tear the damned ‘road to hell before morning.” Jackman claimed they passed Wilson and Kahoe, pretending not to have noticed them or the overheard threat. They then paused at McQuilkin’s coal bank just north of Macksville. They saw Wilson and Kahoe approach and hid from their view. Being good citizens who had overheard threats, they shadowed the pair all the way to St. Marys. There, they saw the foul deed done. They witnessed Wilson going to the depot. He crossed the track and began working on the switch. The “detectives” sensed foul play was afoot. From not far away came the shrill of a whistle. A train was approaching St. Marys. At that point William Chrisman of St. Marys and employed by the very railroad whose train was nearing the depot jumped out of the shadows and shouted, “Don’t do that, Oliver.” It was not the train that “held treasure. Jackman and Knight took their findings to the I & St. L officials. The railroad reported their finding to Terre Haute officials. 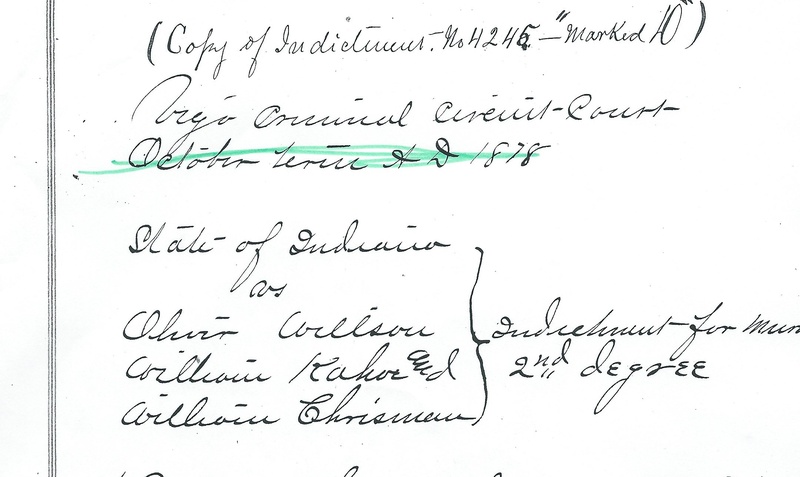 In the October, 1878 term of the Vigo County Circuit Court the grand jury indicted Oliver Wilson, William Kahoe and William Chrisman for the murder of brakeman James Murray in the 2nd degree. William Chrisman, accused murderer, was my great-great grandfather. In the next installment the results of the trial and its twisting aftermath.